Our Vatican tours include private tours of Vatican museum, Sistine Chapel and St. Peter’s Basilica. Private Vatican tours guided by expert tour guides include: Our private Vatican tours include the services of a licensed tour guide, Vatican museum entrance tickets with reservation fees and taxes. Skip the long lines by booking a Vatican private tour. We will secure your tickets with reservation for quick entry. Book well in advance. NOTE: Vatican Dress code (covered knees and shoulders) to enter St. Peter’s Cathedral is strictly enforced. NOTE: Unexpected or closings do occur occasionally and also note that certain parts of the museum or Basilica may be off limits. Your Vatican private tour starts with a guided tour of the Vatican Museum and Sistine chapel. 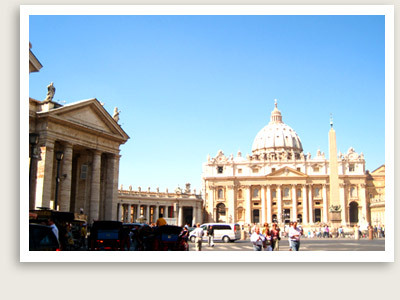 A private tour guide conducts all of our Vatican private tours. The Vatican houses the wealthiest privately-owned collection of masterpieces, showcased in rooms with walls decorated by Raffaello. The real masterpiece, however, is next door: Michelangelo’s painting of the Sistine Chapel, which unexpectedly revolutionized the world’s idea of art. The Sistine chapel is still shaping the future of the Papacy: this is where the cardinals lock themselves in to elect a new Pope after the former one has passed away. NOTE: A visit to the Egyptian rooms, complete with a couple of mummies, may be of interest to the younger visitors. For art lover’s Raphael’s room may be added but you will need an additional hour. A 4-hour tour is needed in this case. Our standard Vatican tour is 3 hours long. Your Vatican private tour ends with the private tour of St. Peter’s Basilica, the largest church in the world. The magnificent and breathtaking complex spans back to 4th century BC, when it was commissioned by Emperor Constantine, though the new cathedral took over 100 years and all of Italy’s greatest artists to build it. Your guided private tour of Vatican City’s St. Perter’s basilica will showcase its vast collection of art including masterpieces by Bernini, Baldacchino and Michelangelo. 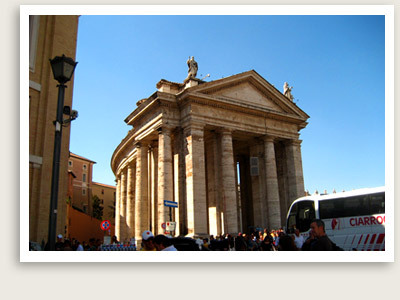 Customize a day tour to include a private tour the Vatican and Rome’s most important sites. Custom private tours of the Vatican and Rome for families, private groups- any size, are available. INQUIRE ABOUT A UNIQUE VATICAN TOUR.